"Gratitude? Look, can't you ever think of me as anything but a brave idiot who chased away a tiger and has to be thanked for it?" German film director Fritz Lang's worldwide fame was sealed when he shot the 1927 silent epic Metropolis. That science fiction classic featured a hard, cold, future world populated by two distinct groups of people: Workers and Thinkers. Aside from introducing one of filmdom's most memorable female robots, in the form of Futura, Lang also stunned audiences with his stark visual imagery, especially that of the Workers dire underground world. Lang's imaginative and dramatic presentations continued as he directed a steady string of visually powerful films throughout the 1930s and 1940s, including M and the Dr. Mabuse series. Lang's longstanding love of the classic silent serial cliffhangers was once again brought to life in 1959, at a time when that genre had nearly vanished, with a pair of risky films, Der Tiger von Eschnapur (The Tiger Of Eschnapur) and the sequel Das Indische Grabmal (The Indian Tomb). These two films were a part of the director's attempt to create an epic adult fairytale/adventure set in India, and were based on a story he had co-written in the early 1920s. Released on unsuspecting German audiences, eager for a new Lang project, the series found great success, although critics there panned it mercilessly as less than adequate. French film audiences embraced it, as well, but that was nearly the extent of any international acclaim. The two films were combined into one 90-minute drive-in B-movie package and entitled Journey To The Lost City and released with tepid results in the United States. 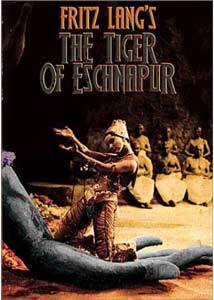 Luckily for Lang buffs, Fantoma Films (distributed by Image) have restored the two original titles, and have released The Tiger Of Eschnapur and The Indian Tomb as two separate discs, with both the original German audio track, as well as a nicely dubbed English mix. At their core, these are B-movies made by a talented director, and as a result have a disarming blend of hokum and entertainment. In The Tiger Of Eschnapur, Western architect Harald Berger (Paul Hubschmid) travels to India to begin a new project for the mysterious Prince Chandra (Walter Reyer). Chandra is the Maharajah of Eschnapur, which resembles something out of a Rudyard Kipling adventure. Lang's expansive vision of India, while distractingly populated by German actors in dark makeup, is a scenic wonder. With much of the film's exteriors shot on location, the unusual architecture, the colorful clothing, the unique way of life all contribute to the creation of an almost alien environment for Berger. During his travels, Berger meets the lovely Seetha (Debra Paget), a temple dancer also bound for Eschnapur and Chandra. During a pivotal sequence, Berger saves Seetha from a vicious tiger attack, and in doing so, finds himself inexplicably drawn to the beautiful dancer. The predictable love triangle between Chandra, Berger and Seetha builds quickly and eventually turns violent. A subplot about a planned overthrow of Chandra by his devious brother only adds to the suspense that Lang tries to create. This is, after all, a glorified serial, so the characterizations are all rather one-dimensional, with a clear cut distinction between villain and hero. But that limitation does not stop a talented director like Lang. His strong suit is shown in his visual artistry, and I found it interesting how he slowly revealed Berger, as well as Seetha, to be in a virtual prison, as the once beautiful surroundings become a series of inescapable doors and hallways. For all of the simple escapism that is on the surface in The Tiger Of Eschnapur, I sense Lang's true intent was to present a dangerous and unknown world, where nothing is as it seems. At times he succeeds, yet at other times the film appears to be nothing more than a simple B-movie. One of the standout moments is an exotic temple dance by Seetha. This is not the kind of dancing one would have found in a prudish American film of that time, and Lang is not shy about having the camera linger on the scantily clad dancer as she moves in the shadow of a massive stone statue. While there are numerous impressive visual elements here, some of the "not so special" effects really date this film. During the scene where Berger saves Seetha from a tiger attack, a laughably matted, fur-clad arm claws menacingly during the battle. Similarly, during a crucial man-against-tiger fight sequence near the conclusion, it appears that a badly stuffed animal is thrown carelessly onto Berger. Later, a decapitated human head is so unrealistic that it borders on comical. The fakir sequence includes a couple of truly bad dissolves that are meant to represent someone "vanishing." Image Transfer Review: My first impression of the image transfer for The Tiger Of Eschnapur was to be literally stunned by the geneally vibrant presentation of a bright color field. Presented in an almost blemish-free 1.33:1 full-frame aspect ratio, Image has managed to keep Lang's 1959 vision alive with a transfer that is surprisingly clean. The foreign world of Eschnapur is an explosion of rich colors, from the fancy apparel worn by the Prince and his charges, to the elaborately decorated building interiors. Exteriors, especially those set in the lush green jungles of India, likewise look remarkably colorful, while the sequences set in the desert feature blue skies that rival those seen in some current DVD releases. Even the flesh tones fare well, with an even, realistic appearance throughout, despite the tacky brown makeup worn by the Prince, etc. In the infamous temple dance sequence, take note of the perfect skin tone of Debra Paget. Occasional color fade at scene changes is the only consistent visual flaw. Audio Transfer Review: This disc features a pair of mono tracks, in the film's original German and a decent English dub. Both tracks are plagued in spots by intermittent hiss, but overall sound fairly clean. The dialogue on both language tracks is clear, and isn't hampered by sounding excessively tinny, as is so often the case on films from that era. The score tends to come across a bit flat, however, though more of a result of the format than anything. Extras Review: This resurrected Fritz Lang adventure has not been given any substantial bonus materials. I would have welcomed some type of commentary or mini-documentary on the celebrated director, but the only significant extra is an informative 3-page insert, written by Lang historian Tom Gunning. A gallery of rare posters and stills, which is a set of twenty production shots and promotional material is only made unique due to brief captions for each. The English subtitles are in exceptionally small type, which makes viewing the original German language version a bit challenging. The disc has a meager 16 chapter stops. The Tiger Of Eschnapur is not one of the best overall examples of the work of Fritz Lang, but it does feature some nice visual elements. The opportunity to see both films in the series in their entirety makes these discs at least worthy of a look.